After a turbulent end to 2018, the New Year has gotten off to an equally volatile start. A ‘flash crash’ greeted investors in the first two days of trading, but since then, some of the pessimism surrounding the outlook for world growth has lessened. While 2018 was all about the US dollar, the greenback got off to a softer start in 2019 as expectations of further rate hikes by the Federal Reserve faded. But as predictions of a dollar downtrend start to gather, there is little on the horizon that bodes well for other currencies: a slowing US economy could still outrun its peers, albeit negligibly, which would keep any sell-off well contained. 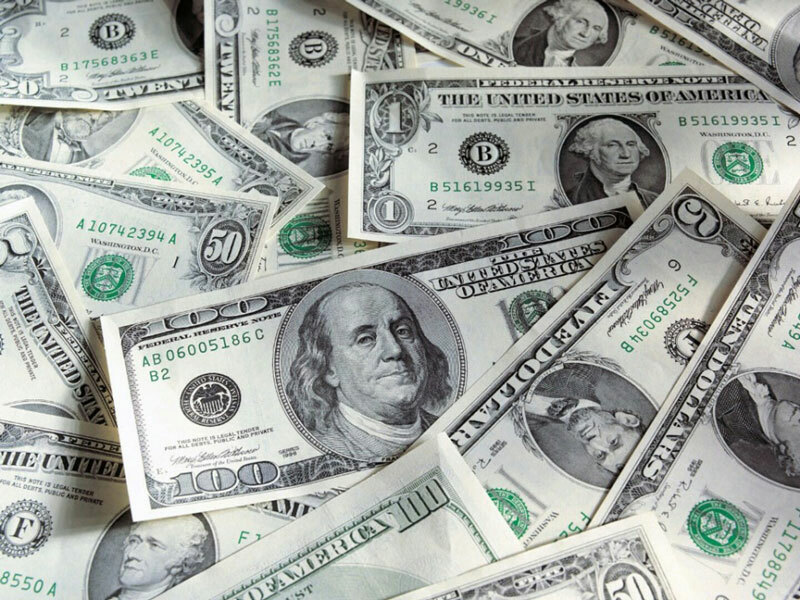 Following a year of broad dollar strength – due to widening interest rate differentials, a booming US economy, and investors seeking the reserve currency’s safety amid global trade tensions – the risks surrounding the greenback in 2019 appear to be subsiding. The Fed is now approaching – or has arguably already reached – terminal rates, at a time when most other central banks are preparing to start their own tightening cycles. Hence, the monetary policy divergence theme may have largely run its course, and the dollar’s carry appeal could gradually lessen. Separately, although markets have turned a blind eye lately, investor concerns about the twin fiscal and current account deficits could return, especially if the economy slows more sharply than anticipated and the higher tariffs have no impact in narrowing the huge trade deficit with China. Political gridlock in Washington and the constant threat of government shutdowns could also haunt the US currency. However, there are also upside risks. Any further deterioration in US-China trade relations may in fact see the dollar attract fresh safe-haven bids. Likewise, if Congress agrees on a massive infrastructure programme that has the potential to boost growth and inflation, it would be a game-changer. Despite starting 2018 on a strong note, the euro’s gains quickly evaporated, and the currency closed the year much lower amid cautious forward guidance by the European Central Bank (ECB) regarding Italian and Brexit risks, as well as global trade worries. While things currently don’t look good for the common currency, better days may lie ahead. The Italian financial crisis seems to have subsided and, more importantly, the ECB is preparing to lift rates sometime after the summer. Markets still haven’t priced in much tightening by the ECB. This suggests the euro has lots of room to run higher if economic growth picks up some steam and allows it to take the next step, especially since the Fed will be near so-called peak rates by then. A potential euro comeback may also be amplified by an unwinding of heavy speculative net short positions. The obvious risk is that growth doesn’t recover, leading the ECB to delay or even abandon its tightening plans. A disorderly Brexit could also derail any euro rebound. Meanwhile, for the Swiss franc, the most important drivers will be the Swiss National Bank’s (SNB) policy stance and safe-haven flows. The SNB seems unlikely to risk making a hawkish turn anytime soon: Swiss data continues to tread water and the bank will probably want to avoid tightening its policy before the ECB does, for fear of a drastic franc appreciation. Hence, aside from some major deterioration in risk sentiment that generates haven demand for the Swiss currency, (in particular, from a resurfacing of the Italian budget row or a new political headache from another eurozone member), the risks surrounding the euro/franc currency pair may be positively skewed over the coming year, as markets see little chance of SNB normalisation prior to the ECB’s action. In the UK, delivering Brexit will be the government’s top priority in 2019, and hence the primary driver for the pound. On January 15, British MPs overwhelmingly rejected Prime Minister Theresa May’s hard-fought withdrawal agreement. However, markets are less fearful of a cliff-edge Brexit, as there seems to be a majority in Parliament that is determined to avoid a no-deal scenario. The question now is whether lawmakers would back a revised deal with the EU, or whether a second referendum is becoming the only viable option. At the time of World Finance going to print, things remain uncertain, but a delay to the departure date is looking increasingly inevitable. An eventual compromise, or the remote possibility of the UK deciding to remain in the EU should a second referendum occur, could send the pound surging higher, as this would not only lift the Brexit fog from the UK economy, but it would also put the Bank of England on course to raise interest rates. However, if the UK leaves without a deal, it could send shockwaves through global financial markets, and the pound could well crash back below the $1.20 level. 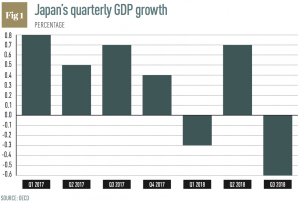 After a brief spell of above-trend growth, the Japanese economy switched back into low gear in 2018 (see Fig 1), dissuading the Bank of Japan (BoJ) from scaling back its massive stimulus programme. Accordingly, the defensive yen has been trading mainly as a function of global risk appetite, paying little attention to domestic economic data. Although market chatter suggests the BoJ could start normalising as early as this year, that prospect remains remote. The economy contracted in Q3 2018, underlying inflation is muted, and the government plans to raise the sales tax in October 2019. The last time it increased this tax, a recession ensued, so the BoJ will probably avoid any bold moves ahead of it. Hence, rate differentials between Japan and other economies may stay wide or widen further, which in isolation argues for a weaker yen over time. For the currency to soar, it may require an unexpected pick-up in inflation, or – more realistically – a sustained period of global risk aversion. Similarly, the Canadian (CAD), Australian (AUD) and New Zealand (NZD) dollars all had a difficult time in 2018 amid struggling commodity prices, a resurgent US dollar and flaring trade tensions between the US and China. Given that these economies are heavily export-orientated, dwindling global trade volumes could impact them severely. For the CAD, collapsing oil prices were crucial too. The outlook for 2019 depends predominantly on whether the US-China trade negotiations bear fruit or simply fall apart. In early January, optimism that the two trading giants were making progress in ironing out their differences over trade policy prompted an immediate rally in oil and commodity-linked currencies. This suggests the CAD, AUD and NZD stand to gain significantly from any Sino-US trade breakthrough. In terms of monetary policy, no rate hike is expected by either the Reserve Bank of Australia or the Reserve Bank of New Zealand. In fact, market pricing implies a small probability for a rate cut by both central banks amid slowing growth and sluggish inflation. Odds for a rate increase by the Bank of Canada have also dissipated rapidly, though not completely, following the turmoil that jolted markets in December. At this point in the year, many of the headwinds and uncertainties that determined price action during 2018 have yet to be resolved. As a result, monetary policy normalisation outside the US, which many traders saw as a sure bet at the start of 2018, is looking increasingly precarious in 2019. With growth and inflation in the eurozone and Japan – the world’s second and fourth-largest economic blocs – dwindling again, there’s a real danger that interest rates may not return to positive territory before the next recession. This raises questions about what additional policy tools would be available to central banks when the next downturn strikes, which could well be in 2019. Both economies are highly vulnerable to an escalation in the US’ trade fight, while the eurozone faces additional risks from a no-deal Brexit and from populist European governments upsetting the EU political order. The risks for the Chinese economy are also tilted to the downside. A profound slowdown in China is likely to hurt the global economy more than the US’, which would likely still outperform the rest of the world even if trade frictions were to intensify. A bigger threat for the dollar than a Fed rate pause and moderating growth could be political instability in the White House, given President Trump’s continued, if not worsening, unpredictable and destabilising behaviour. However, with US Treasury yields still at relatively high levels, any sustained decline in the dollar is likely to be limited in a risk-off environment. Without a rebound in growth in other parts of the world, the dynamics that came into play in the currency markets in late 2018 could persist well into 2019.